Chronic kidney disease (CKD) is common and continues to rise globally. Cytokines are important modulators of inflammation, and both CKD and end-stage renal disease (ESRD) are characterized by elevated levels of pro-inflammatory cytokines. Interleukin-6 (IL-6) is a pleiotropic and pro-inflammatory cytokine involved in different biological activities such as hematopoiesis, inflammation, and acute-phase response. IL-6 has several polymorphisms in the promoter region (174G/C, 634C/G, 572G/C, and 597G/A). The 174G/C polymorphism in the promoter region of IL-6 gene was first recognized in 1998 by Fishman et al. The rate of IL-6 synthesis and degradation is affected by single nucleotide polymorphisms. This study aimed to evaluate the frequencies of 174G/C IL-6 gene promoter polymorphism in Iraqi CKD patient on maintenance hemodialysis (HD) and compare them with a group of healthy controls and to examine the association between the allelic variations and serum erythropoietin (EPO) and hemoglobin (Hb) levels. This prospective study was carried out at Medical City Complex, Baghdad Teaching Hospital, Iraqi center of kidney dialysis from November 2015 to June 2016. The participants who completed the courses of the study successfully were recruited into the following groups: patient group consisting of 70 patients (40 males and 30 females) on maintenance HD for at least six months and receiving methoxy polyethylene glycol epoetin-beta (MPGE-β) and control group consisting of 20 healthy participants (10 males and 10 females) who were medical free. Exclusion criteria included acute renal failure, age <18 years, inadequate data, central nervous system diseases and psychiatric disorders, renal carcinoma, and recent symptoms and signs of bleeding that required a blood transfusion. Six milliliters of venous blood sample were drawn from each patient in the morning just before the start of the dialysis session after an overnight fasting from the HD needle puncture. Samples were drawn from each patient at the beginning of the study (as baseline sample) and then after three months and after six months of baseline sample to follow-up the changes in the studied parameters. Five millimeters of blood sample was transferred into clean gel tube (that contains clot activator), left at room temperature for at least 30 min for clotting, centrifuged for 5–10 min at 3000 rpm to obtain serum. Serum then was stored at −80°C until time for the assay. The remaining 1 mL of the blood sample was transferred to a clean tube containing ethylenediaminetetraacetic acid and stored at -80°C until time for genomic DNA analysis. A single blood sample was drawn from each participant of the control group. PCR was carried out under the following conditions: denaturation by first heating the samples at 95°C for 3 min followed by 35 cycles of denaturation at 95°C for 30 sec, annealing at 53°C for 30 sec, first extension at 72°C for 30 sec, and a final extension at 72°C for 5 min. PCR products were then digested with 1 unit of NlaIII restriction enzyme. After incubation at 37°C for 2 h, the enzyme cuts the 198 base pair (bp) PCR’s product into four fragments 168, 119, 49, and 30 bp in length. Fragments size of 119 and 49 bp indicated the presence of a wild-type homozygous CC genotype; 168, 49, and 30 bp fragments displayed the presence of homozygous GG genotype; and fragments of 168, 119, 49, and 30 bp indicated the presence of heterozygous CG genotype. The resulting products were tested by 3% agarose gel electrophoresis at 150 volts for 60 min and visualized at room temperature under ultraviolet light after ethidium bromide (0.5 μg/mL) staining. Serum EPO is determined through DEMEDITEC EPO immunoassay that is a two-site ELISA for the measurement of the biologically active 165 amino acid chain of EPO. The study protocol was approved by the local ethics committee in the college of medicine, Baghdad University, Iraq, with verbal informed consent from patients. Statistical calculations were performed using the Statistical Package for the Social Sciences program (SPSS) version 20.0 (SPSS Inc., Chicago, Illinois, USA) and Minitab version 17 software. In all comparisons, P <0.05 was considered statistically significant. Anderson–Darling test was performed to test the adherence of continuous variables to normal distribution. Discrete variables presented using their number and percentages. The Chi-square test was used for comparisons of discrete variables between each study group. Alleles and genotype frequencies of IL-6 at promoter region of – 174G/C were obtained by direct count. 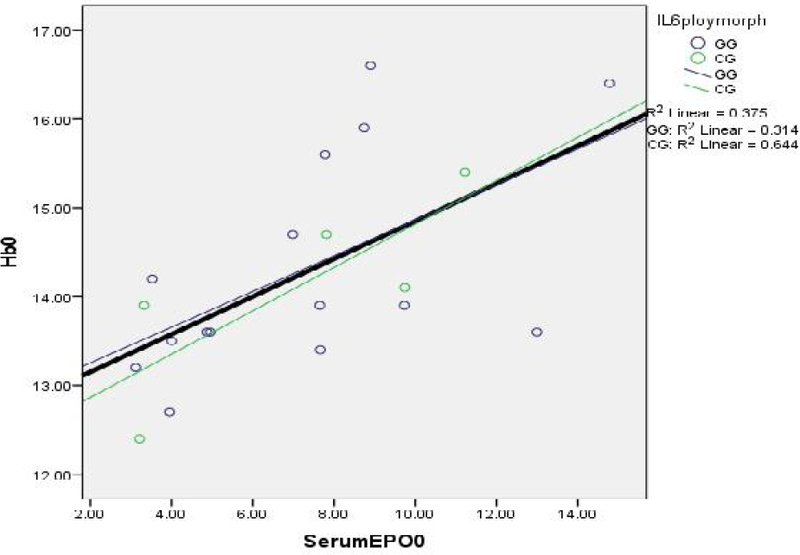 Linear regression analysis was performed to assess the relationship between serum EPO and Hb. Demographic and laboratory data of the study groups are shown in [Table 1]. The RFLP detection system is schematized in [Figure 1]. The distribution of IL-6 genotypes and their alleles between the study groups is similar (P >0.05), as shown in [Table 2] and [Table 3]. The prevalence of IL-6 genotypes in patients group is diverse with GG genotype being the most frequent (69%), followed by CG genotype (24%) and CC (7%). Table 1: Demographic data and laboratory parameters of the study groups at baseline level. Figure 1: A 3% agarose gel electrophoresis. Lane M: DNA Ladder. Lane 3, 8: CC homozygote genotype (bands at 119 bp and 49 bp). Lane 1, 2, 4, 5, 6, 7, 10, and 11: GG homozygote genotype (bands at 168 bp, 49 bp, and 30 bp). Lane 9, 12: CG heterozygote genotype (bands at 168 bp, 119 bp, 49 bp, and 30 bp). Table 2: Distribution of IL-6 gene polymorphism in the study groups. Table 3: Distribution of individual alleles of IL-6 gene in the study groups. As illustrated in [Table 4], the control and patient groups had a nonsignificant difference in serum EPO levels among different IL-6 genotypes (P >0.05) at all time periods. 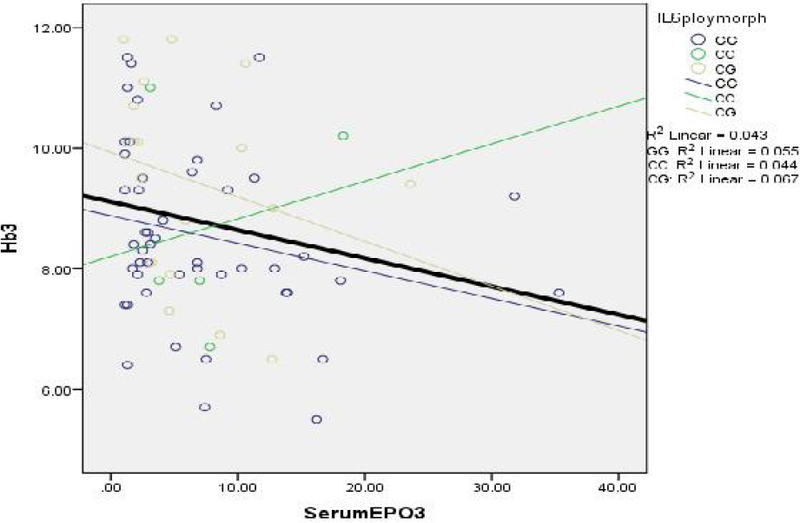 Patients with GG genotype displayed more statistically significant (P <0.05) elevation in serum EPO levels with time, followed by CG and CC genotypes. Table 4: Serum erythropoietin levels (mIU/ml) divided by IL-6 gene polymorphism. Data expressed as median (IQR). As illustrated in [Table 5], no significant differences (P >0.05) in Hb levels were observed for patients and controls among the different IL-6 genotypes. Results presented in [Table 6] and [Figure 2] show that the overall correlation between Hb and EPO in control group was statistically significant (P <0.05) and moderately positive. Moreover, in GG genotype group, the correlation was significant, while CG genotype showed a strong but nonsignificant correlation. Table 5: Hemoglobin levels (g/dL) divided by IL-6 gene polymorphism. Data expressed as mean ± SD. Table 6: Correlation between hemoglobin and serum erythropoietin in the control group for each IL-6 genotypes at baseline. Figure 2: Scatter plot for control group describing the correlation between hemoglobin and erythropoietin. Black line represents the overall relationship. Results presented in [Table 7] and [Figure 3] show that the overall correlation between Hb and EPO in patients at baseline was nonsignificant (P >0.05) and weakly negative; however, only CG genotype had a moderately negative significant correlation, while CC genotype had a nonsignificant correlation. Table 7: Correlation between hemoglobin and serum erythropoietin in patients for each IL-6 genotypes at baseline. Figure 3: Scatter plot for patients group describing the correlation between hemoglobin and serum erythropoietin at baseline. Black line represents the overall relationship. Results presented in [Table 8] and [Figure 4] showed that the overall correlation between Hb and EPO in patients at three-month interval was nonsignificant (P >0.05) and weakly negative, and CG and GG genotypes had an inverse and nonsignificant correlation while CC genotype had a nonsignificant and direct correlation. Table 8: Correlation between hemoglobin and serum erythropoietin in patients for each IL-6 genotypes at 3-month interval. Figure 4: Scatter plot for patients group describing the correlation between hemoglobin and serum erythropoietin at 3-month interval. Black line represents the overall relationship. Results presented in [Table 9] and [Figure 5] showed that the overall correlation between Hb and EPO in patients at six-month interval was nonsignificant (P >0.05) and weakly negative, and CG and GG genotypes had an inverse and nonsignificant correlation while CC genotype had a nonsignificant and direct correlation. Table 9: Correlation between hemoglobin and serum erythropoietin in patients for each IL-6 genotypes at 6-month interval. Figure 5. Scatter plot for patients group describing the correlation between hemoglobin and serum erythropoietin at 6-month interval. Black line represents the overall relationship. 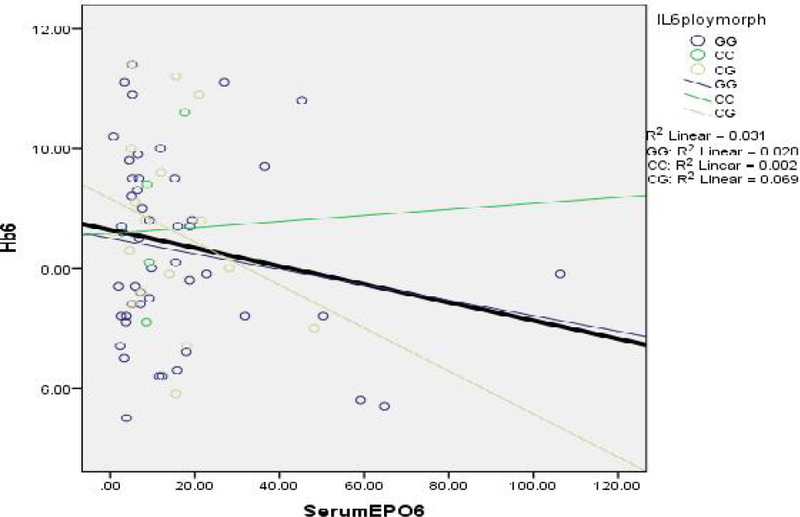 a nonsignificant negative correlation between serum EPO and Hb in CKD patients with different IL-6 genotypes except in patients with CC genotype in whom a nonsignificant positive correlation was been observed. 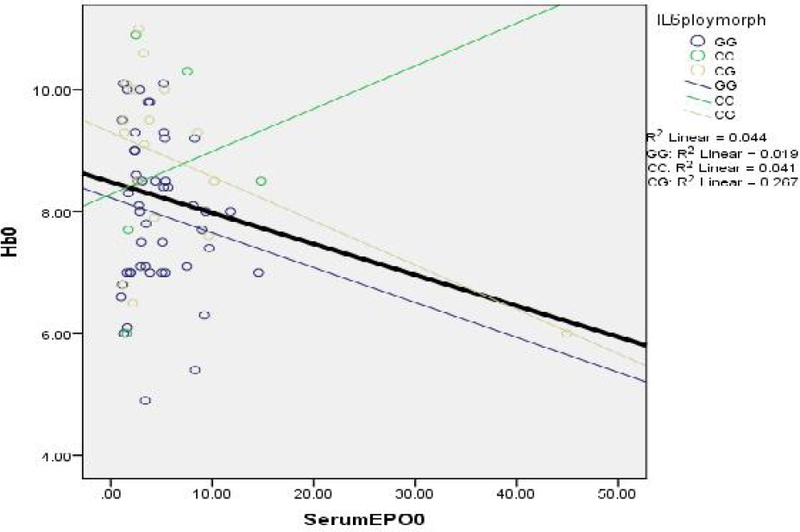 Panjeta et al investigated the correlation between EPO, hematocrit, and/or Hb depending on the level of renal insufficiency. A correlation between EPO and hematocrit and/or Hb was found in healthy participants (P <0.0005). Rahman et al also showed no significant correlation between EPO and Hb in CKD patients. This study was limited by its small sample size and single-center focus, besides that, this study enrolled only CKD patients in Baghdad city; therefore, caution is needed in generalizing the finding of this study with other populations. CKD especially ESRD did not significantly alter the distribution of IL-6 genotypes. IL-6 gene polymorphism had a significant effect on serum EPO levels and patients with GG genotype displayed a significant elevation in serum EPO levels with time, followed by CG and CC genotypes. On the other hand, IL-6 gene polymorphism did not have a significant effect on Hb levels in Iraqi CKD patients. The authors acknowledge the contribution and cooperation of the patients enrolled for the study. Al-Radeef MY, Ismail SH, Allawi AA. Predicting resistance to recombinant human erythropoietin therapy in CKD patients on maintenance hemodialysis. Int J Sci Res 2016;5:1020-7. Turner MD, Nedjai B, Hurst T, Pennington DJ. Cytokines and chemokines: At the crossroads of cell signalling and inflammatory disease. Biochim Biophys Acta 2014;1843:2563-82. Rao M, Wong C, Kanetsky P, et al. Cytokine gene polymorphism and progression of renal and cardiovascular diseases. Kidney Int 2007;72:549-56. Mutlu P, Yalcin S, Elci P, et al. Association of - 174G/C interleukin/6 gene polymorphism with the risk of chronic lymphocytic, chronic myelogenous and acute myelogenous leukemias in Turkish patients. J BUON 2014;19:787-91. Fishman D, Faulds G, Jeffery R, et al. The effect of novel polymorphisms in the interleukin-6 (IL-6) gene on IL-6 transcription and plasma IL-6 levels, and an association with systemic-onset juvenile chronic arthritis. J Clin Invest 1998;102:1369-1376. Pourhossein M, Ghavimi R, Alsahebfosoul F, Ghaedi K. Association between rs1800795 (-174 G/C) polymorphism in the promoter of IL6 gene and risk of relapsing-remitting multiple sclerosis (RRMS) in Isfahan population. Open J Genet 2014;4:407-13. Losito A, Kalidas K, Santoni S, Jeffery S. Association of interleukin-6 -174G/C promoter polymorphism with hypertension and left ventricular hypertrophy in dialysis patients. Kidney Int 2003;64:616-22. Spoto B, Mattace-Raso F, Sijbrands E, et al. Association of IL-6 and a functional polymorphism in the IL-6 gene with cardiovascular events in patients with CKD. Clin J Am Soc Nephrol 2015;10:232-40. Ryu JH, Kim SJ. Interleukin-6 -634 C/G and -174 G/C polymorphisms in Korean patients undergoing hemodialysis. Korean J Intern Med 2012; 27:327-37. Liu Y, Berthier-Schaad Y, Fallin MD, et al. IL-6 haplotypes, inflammation, and risk for cardiovascular disease in a multiethnic dialysis cohort. J Am Soc Nephrol 2006;17:863-70. Panjeta M, Tahirovic I, Karamehic J, Sofic E, Ridic O, Coric J. The relation of erythropoietin towards hemoglobin and hematocrit in varying degrees of renal insufficiency. Mater Sociomed 2015;27:144-8. Rahman M, Haque M, Towhidul Alam AS, et al. Serum erythropoietin level in chronic kidney disease patients with anemia: A baseline study at Chittagong medical college, Chittagong, Bangladesh. Am J Clin Exp Med 2016;4:20-5.